Dan Wiederer of the Minneapolis Star-Tribune reports that the Vikings have agreed to terms with 15 undrafted free agents. The Vikings used ten draft picks on Thursday through Saturday, so in all they’ve brought aboard 25 rookies in less than a week. Boise State defensive tackle Chase Baker, UCLA running back Derrick Coleman, Florida Atlantic defensive end Kevin Cyrille, Nicholls State cornerback Bobby Felder, Bowling Green receiver Kamar Jorden, Penn State defensive end Eric Latimore, Iowa linebacker Tyler Nielsen (pictured), Cal defensive end Ernest Owusu, Hawaii linebacker Corey Paredes, Vikings guard Austin Pasztor, North Carolina defensive tackle Tydreke Powell, Missouri defensive tackle Terrell Resonno, Mississippi State center Quentin Saulsberry, Oregon tackle Darrion Weems, and South Carolina cornerback C.C. Whitlock. The Iowa linebacker Nielsen stands out as a player who may push hard to crack the Vikings’ final 53-man roster. 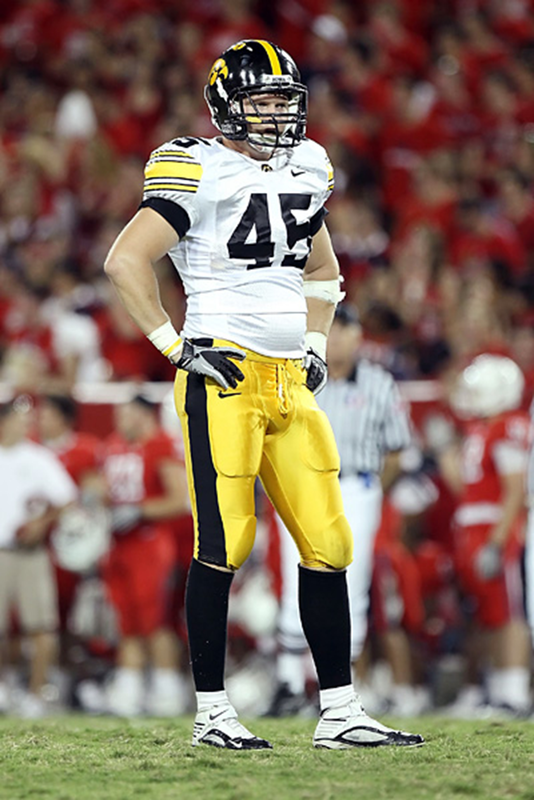 Nielsen was a special teams dynamo as a freshman and sophomore under Kirk Ferentz, before taking over as a starting outside linebacker for his junior and senior seasons. Nielsen is 6-foot-3 and 238 pounds. NFL Network’s Mike Mayock pegged Nielsen as sleeper before the draft, suggesting Nielsen could eventually emerge as a starting strong-side linebacker in the league.